Posted March 8, 2017 by Tony Jones & filed under Books. 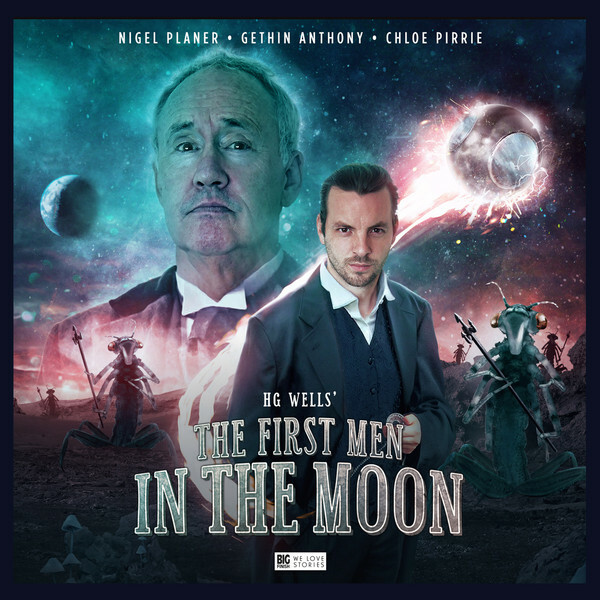 The HG Wells season continues at Big Finish with First Men in the Moon, a tale of exploration and adventure. On one level this 1901 story is a then modern take on how science might help man journey into space, and centres on two characters, the scientist Professor Cavor (Nigel Planer) and his associate, the opportunistic businessman Bedford (Gethin Anthony). Jonathan Barnes adapted the original, adding an extra character, Maria Bell (Chloe Pirrie). The core story is unchanged: Cavor has invented Cavorite, a magic substance allowing the force of gravity to be shielded. It’s a clever idea, and Bedford sees the commercial potential of controlling access to space, whereas Cavor just wants to explore and learn. He we see Wells at work; under the fantasy tale we have a story about the ruthless exploitation of capitalism, though Cavor is too idealistic for his own good. The tension between these world views drives the early part of the story until they reach the Moon. Here the story dives into what we might now term pure fantasy, with moon cows, moon plants, the natives (called Selenites and played by Alan Cox) and their leader the Grand Lunar (David Horovitch). Under the Boys Own style of adventure there’s a motif of colonialism but not overdone. In this adaptation, Jonathan Barnes adds a new character with more depth than the token fiancée in the 1964 film with effects by Harryhausen and screenplay by Nigel Kneale. Maria’s part is a genuine and plausible surprise and allows a very Wellsian ending to be crafted onto this adventure. In terms of production it’s the usual immaculate effort from the Big Finish team, starting at Lisa Bowerman’s direction and ending at Peter Doggart’s sound design. In between three wonderful performances. Gethin Anthony’s Bedford is self-centred, self-deluding and avaricious. As narrator and central figure in the story he has few, if any, redeeming features but avoids being a stereotype. He contrasts with Nigel Planer’s measured Professor Cavor, and if Big Finish ever needs another actor for the first Doctor, this was almost Hartnell at times. Chloe Pirrie made the most of a small but important role, and must surely be heard again on many more releases. She brought her character to life with great skill and helped break-up what can otherwise feel like a somewhat dated style of writing with the story being led (in the main) by narration. As ever it’s a remarkable release, and even if we now know much more about the Moon than our predecessors, this is a good story and shows Wells’s skills as a crafter of stories. Released in March 2017 by Big Finish.